Books could now be standard sizes, making their storage and transportation easier. Mail would be easier to ship, weigh, and sort, and offices would be able to more efficiently store documents, files, binders, and portfolios. Uniform-sized books led to standard bookshelves, standard files to standard filing cabinets. Desks could be built to perfectly hold all the paper they needed, without wasting a centimeter. Offices could be built to perfectly fit the desks. Soon different businesses like banks, libraries, and administrative offices could begin to fit together, like a machine. By the early 1930s Neufert was an accomplished architect, and a leader in the field of construction technology. In 1936 Hitler implemented a four-year plan to prepare for war, which, among other things, involved rebuilding Berlin into a massive world capital, complete with grand, Parisian-style boulevards, new train stations, and massive apartment buildings. In 1938 Hitler’s chief architect Albert Speer hired Neufert to, as Speer put it, “oversee the standardization of building parts, and the rationalization to building methods.” He got to lead his own team of designers and technicians. They were called The Neufert Department. For the project to succeed, construction had to happen quickly and cheaply, and Neufert had to figure out how to streamline and simplify every step of the process. Trying to meet these demands, Neufert thought back to the A Series of paper formats, and what had made them so successful. The beauty was in this standard’s ability to affect not just paper, but everything that interacts with paper—desks, drawers, offices, mailmen. To have a similar ripple effect throughout all of construction and design, what, then, should you change? And so he did. He created the Octametric Brick, a standard-sized masonry unit that would come to replace any other sized brick in Germany (the bricks were 12.5 centimeters wide, or one-eighth of a meter, hence its name). Adoption of the brick, as Neufert saw, would create a standardized, modular world that all construction would occur in—no more custom shapes or sizes within buildings, no more worrying that cabinets would be the same height as the stove. With the Octametric Brick, buildings could still look different and be different sizes, but everything, when reduced to its smallest part, would have this as a base unit. This overarching uniformity, based around the dimensions of a single brick, would be called the Octametric System. Even if products were made of other materials, under this system their dimensions would always have to be evenly divisible by one-eighth of a meter. Everything would finally fit together. The Nazi government loved it. The Octametric System helped solve several construction issues the regime faced, the most pressing of which was how make the act of building—something that had traditionally been done by skilled craftspeople—simple enough for unskilled laborers to perform. The modular nature of the Octametric System made construction relatively easy and error-proof, more like assembly of building blocks than fine woodworking or masonry. While Neufert’s Octametric System never officially spread beyond Germany, it came to have a tremendous effect on building standards around the world. Throughout his life, Neufert continued to update his encyclopedia of architectural standards, Architects Data. Starting in the 1940s, his Octametric System began to reshape the contents of his book. Ideal dimensions within buildings were altered ever-so-slightly, so as to now be divisible by one-eighth of a meter. Today Architects Data is one of the most popular reference books in architecture. It’s currently in its 40th edition, and has been translated into 20 languages; from France to Argentina to Iran, architects around the world open it up when trying to decide how tall to make a door, or how wide to make a parking spot. In this way the Octametric System still lives on in much of the world, even if most designers have never heard of it, or know anything about the man responsible for its creation. Japan has 12 basic zones, far fewer than is typical in an American city. The zones can be ordered in terms of nuisance or potential externality from low-rise residential to high-rise residential to commercial zone on through to light industrial and industrial. But, and this is key, in the US zones tend to be exclusive but in Japan the zones limit the maximum nuisance in a zone. So, for example, a factory can’t be built in a residential neighborhood but housing can be built in a light industrial zone. In addition, residential means residential without discrimination as to the type or form of resident. They built their houses differently. We may not think about it much, but the invention of the air conditioner radically changed the way people built buildings, especially in the south. You may have noticed that older buildings tend to have much higher ceilings: this allowed heat to rise so that inhabits could enjoy the cooler space below. Deep eaves and porches protected windows from the heat of the sun, and it was common to plant trees on the east and west sides of a house for additional shade. In addition to this, rooms were designed with windows on opposite sides of the space, which allowed for cross ventilation. Air likes to have a place to go, so opening up a single window won’t generate much air movement. But open two windows right across from each other and you can get a nice breeze going. In cases where it wasn’t possible to have two windows on opposite sides of a single room, architects would line up rooms in a row, allowing air to flow between them. You can see this in old shotgun homes in New Orleans, or in railroad apartments in New York. Currently the porch, like the fireplace, is a charming but somewhat vestigial architectural feature. But in the past porches were incredibly important, not just for shading the windows of a home, but also for providing a place where people could sit outside, out of the glare of the sun, and perhaps enjoy a breeze. These days, when it’s hot, people flock inside, but in the past it was the opposite: temperatures indoors and out were more or less the same, and the porch was much less stuffy than the rest of the house. This led to a whole culture of people sitting outside on their porches after supper, which has essentially disappeared. Some older houses were also built with sleeping porches, screened-in porches where one could sleep during the summer, enjoying the breezes but protected from bugs. New Yorkers replicated this by sleeping on the fire escape on especially hot days. About $47.5 billion of loans backed by retail properties are set to mature over the next 18 months, data from Bank of America Merrill Lynch show. Green Street estimates that several hundred malls could shut down over the next decade, with properties reliant on Macy’s, JC Penney and Sears at the most risk. Sales at department stores, once the engines that powered shopping centers across the U.S., have declined almost 20 percent since 2006, according to the firm. About 800 department stores would need to shut down to restore balance between sales and profitability, Green Street said in an April report. Unlike the Bay Area, which pursued a “high wage specialization strategy,” Los Angeles, in the interest of social justice, deliberately focused on lower- and middle-tier economic sectors. “Los Angeles’s leaders generated a low-road narrative for themselves, while Bay Area leadership coalesced around a high-road vision for their region,” they write. Such decisions have consequences, many of which are demographic. Had Los Angeles followed the same path as San Francisco, Southern California would have attracted far fewer working-class Latinos. The authors don’t directly state this, but it’s a clear implication of their findings. It’s logical to conclude that any region looking to replicate San Francisco’s success should take an exclusively high-end focus — social justice be damned. Situated on a plain, Benin City was enclosed by massive walls in the south and deep ditches in the north. Beyond the city walls, numerous further walls were erected that separated the surroundings of the capital into around 500 distinct villages. Pearce writes that these walls “extended for some 16,000 km in all, in a mosaic of more than 500 interconnected settlement boundaries. They covered 6,500 sq km and were all dug by the Edo people … They took an estimated 150 million hours of digging to construct, and are perhaps the largest single archaeological phenomenon on the planet”. Barely any trace of these walls exist today. Benin City was also one of the first cities to have a semblance of street lighting. Huge metal lamps, many feet high, were built and placed around the city, especially near the king’s palace. Fuelled by palm oil, their burning wicks were lit at night to provide illumination for traffic to and from the palace. When the Portuguese first “discovered” the city in 1485, they were stunned to find this vast kingdom made of hundreds of interlocked cities and villages in the middle of the African jungle. They called it the “Great City of Benin”, at a time when there were hardly any other places in Africa the Europeans acknowledged as a city. Indeed, they classified Benin City as one of the most beautiful and best planned cities in the world. At the centre of the city stood the king’s court, from which extended 30 very straight, broad streets, each about 120-ft wide. These main streets, which ran at right angles to each other, had underground drainage made of a sunken impluvium with an outlet to carry away storm water. Many narrower side and intersecting streets extended off them. In the middle of the streets were turf on which animals fed. Dapper adds that wealthy residents kept these walls “as shiny and smooth by washing and rubbing as any wall in Holland can be made with chalk, and they are like mirrors. The upper storeys are made of the same sort of clay. Moreover, every house is provided with a well for the supply of fresh water”. Traditional architecture — derived ultimately from the columns, pediments, arches, and other features of ancient Greece and Rome — evolved by trial and error, teaching best practices to builders and architects generation by generation. The centuries forged a classical language that fostered architecture sensitive to the public’s desire for “congenial facades.” But in the mid-20th century, new ideas took over, and the public has ever since been subjected to endless experimentation and vanity projects. In most cities and towns, the way new buildings look is not influenced by public taste, which is generally traditional. Instead, it is the purview of municipal and institutional facilities committees, design-review panels, the developers who hire architects who cater to the tastes of officialdom, and the local circle of professionals, academics, and journalists who may be relied upon to cluck at any deviation from the elite fashion in the design of new buildings. Modern greenhouses are now in the vanguard of sustainability. The logic of farmers’ markets begins with this: that the route from harvest to plate ought to be as direct as possible. That’s fine if farmers live round the corner from consumers. But urban land is in short supply, expensive, often polluted, and unsuitable for horticulture. And there is more. Even in a short chain from farm to table, produce can get spoiled. A fresh tomato is not dead; like all fresh products, it’s a living organism with an active metabolism, post-harvesting, that provides a fertile substrate for microorganisms and causes tomatoes to deteriorate very fast. Freshness does not in itself translate into sustainability: unless the supply chain is well?organised, losses can be considerable. And food losses come down to a waste of land, water, energy and chemicals used to produce what is ultimately discarded. This ought to be a good argument for local markets, but it is not. Everything depends on transportation, storage and speed. Poorly packed products go to waste in a matter of hours. Thanks to decades of research, we now understand the interacting metabolisms of vegetables and microorganisms. We can design high-tech transport and storage techniques that slow down, even halt, deterioration through the use of harmless mixtures of gases. Chips fitted to containers give off signals when the gas composition and temperature need adjusting to plan ripening at the exact moment of delivery. Likewise, to minimise food losses in supermarkets, packaging techniques and materials have been developed to prolong shelf life. Surprising but true: modern treatments with biodegradable plastic bags and sealing create an optimal environment inside the package and reduce loss. So does the industrial washing of packed and cut vegetables, which also saves water, compared with household?level processing. What then of labour? While ‘handpicked’ sounds attractive to the urban consumer or occasional gardener, this type of manual labour is backbreaking if done all day long. Remuneration is poor, job security close to zero, and only few are willing to do this kind of work. To top it all, the yield from organic farming is low. So think about the alternative: harvesting vegetables such as tomatoes with smart robots that carefully grab each fruit, after assessing its ripeness with a special camera; using smart technology to fine-tune the dosing of fertiliser to every stage of plant development. This enhances flavour and texture, and reduces the overall amount of fertiliser needed. The result is that, in greenhouses, one square metre of tomato plants produces more than 70 kilos of high?quality tomatoes, all of which make it to consumers’ kitchens. In complete contrast to the mantras of organic farming, modern greenhouses are now in the vanguard of sustainability. No longer net?energy absorbers, pilot schemes show that they can produce enough additional energy to heat an entire neighbourhood by storing excess heat from the summer sun in groundwater to be released during winter. Since plants use only a small part of the solar spectrum in photosynthesis, modern technology enables us to find applications for the rest of the spectrum. Greenhouses also utilise residual CO2 from industry to promote plant growth and, in the Netherlands, CO2 from natural?gas production is routinely reused in agriculture. Conceiving greenhouses as net?energy producers opens up new opportunities to build them in hot, arid climates in order to use the stored energy for cooling down the facility. But energy is just one dimension of sustainable production. Water is equally important. Here too, greenhouses optimise resource use. Under the very best conditions, one kilo of tomatoes can be produced using just 4-6 litres of water, because evaporation from plants can be collected and reused. Meanwhile, according to a 2015 study published in Science Direct , for tomatoes grown in the open air or under open plastic, the production of the same one kilo requires as much as 60 litres of water. Just as water might be reused in greenhouses, pests can be kept out. In a controlled environment, you can minimise the use of pesticides, or opt to use biological controls in the form of predatory insects. So what do we really mean by sustainability? There have been many attempts at providing an exact and measurable definition beyond the statement of the Brundtland Report (1987), which coined the term in the context of equitable development that would not endanger the livelihoods of future generations. The concept originated in 19th-century forestry science to indicate the amount of wood that could be harvested from a forest without damaging future productivity. Since then, it has evolved to mean ‘respecting people, planet and profits’, in the parlance of the UN Earth Summit of 1992 and subsequent Millennium Development Goals. Straight Outta Compton is much celebrated by white critics for showing our heroes being hassled by suspicious police. (Ferguson is often cited by enthusiastic reviewers.) But, even sanitized as the film is — Dr. Dre’s penchant for beating women was left out, and I can’t recall a single scene of anybody smoking crack — Straight Outta Compton is still full of so much puerile mayhem that it’s hard to conclude that the cops weren’t sensible in trying to run these jokers out of town. For example, when the Torrance police see our heroes hanging around outside the recording studio in gang gear, they force them down on the ground to send the message that Torrance isn’t gang ground. Their manager, middle-aged macher Jerry Heller (played by Giamatti) excoriates the cops: These aren’t criminals, they’re artists. And indeed they weren’t affiliated with either the Crips or the Bloods. Just as drummer Dennis Wilson was the only surfer in the Beach Boys, N.W.A’s not-very-skilled frontman Eazy-E was the band’s only career criminal, and he was in the weed-dealing business (a less murderous line of work than cocaine). The more talented members were boys from respectable families who’d avoided serious trouble to focus on their entertainment ambitions. (Dr. Dre appears to have prudently restricted his violence to hitting girls.) But they couldn’t tell the cops that they were just pretending to be vicious thugs to sell records because that would have undermined their lucrative vicious-thug image. I was particularly struck by their encounter with the Torrance police because I had looked into buying a house in that suburb in 1991. Like much of Southern California near the ocean, Torrance’s housing stock was of poor quality. (Before antibiotics, rich people had built inland in places like Pasadena out of fear that ocean fog causes tuberculosis.) And Torrance’s enormous oil refinery tends to periodically belch noxious fallout over homeowners. But the schools were good because it’s a low-crime community. Today, while the Beach Boys’ Hawthorne, three miles north of Torrance, is over 80 percent Latino or black and Compton is 99 percent non-Asian minority, Torrance is still 42 percent white, 35 percent Asian, 16 percent Hispanic, 6 percent mixed, and only 3 percent black. Torrance’s homicide rate in this century has been about one-fifth of Hawthorne’s and one-twentieth of Compton’s. How did Torrance dodge this (literal) bullet? After watching Straight Outta Compton , I would guess: by the Torrance Police Department profiling black youths dressed as killers. Why did Torrance have the courage to save itself? I don’t know. Perhaps because Torrance’s large, politically powerful Asian presence (Torrance was the American headquarters of Toyota from 1982 to 2014) was immune to white guilt? You may have somehow gotten the impression that tearing down Cabrini Green was all about driving out poor black people from right next to the Gold Coast to add billions to local property values. But, it turns out, it was really about Chicago generously Sharing Diversity with deprived suburban municipalities. Americans were long extremely proud of settling the continent. The pioneers’ struggle against nature was an objective accomplishment that enthralled the world: Westerns were one of the most popular genres of movies from 1903 to 1970. American settlers combined independence and cooperation well, especially in contrast to the fractious Native Americans, who constantly stabbed each other in the back with self-destructive rivalries rather than unite to fight the white man. Old-fashioned science fiction — Heinlein, Star Trek, Interstellar — tended to be about opening up a New Frontier that would allow Americans to once again flourish at what they do best: contend with nature for objective gain rather than with each other for subjective pride of place. Indeed the race to the moon proved a nonviolent way for Americans and Soviets to compete against the physical universe to show off who would win if they went to war against each other. Different kinds of science evolve best under different conditions. Evolutionary theory is very much a product of the countryside, especially of England’s culture of intellectual country boys. On the other hand, Claude Shannon worked out information theory in Greenwich Village. In the red-blue debate, both sides view the other as horrifyingly conformist: In the country, you can’t get away from people who know you, while in the city, you can’t get away from people, period. The kinds of businesses found in lightly populated areas tend to be agriculture, energy, and other forms of resource extraction, and, as population increases, construction and heavy industry. The type of industry found in the highest-density places tends toward finance, law, media, fashion, and marketing. In my ill-fated venture into the marketing profession, for instance, I had a corner office directly across Wacker Drive from the Sears Tower, then the tallest skyscraper in the world. Granted, it was an inconvenient place from which to attempt to manipulate the habits of the average grocery shopper since it was an expensive cab ride from the nearest supermarket, but the view was amazing. Silicon Valley started off on the exurban frontier between San Francisco and San Jose because early chipmakers needed open land to build fabrication plants. And the kind of engineers who wanted to work on the problems that firms like Hewlett-Packard and Intel were solving preferred living in their own houses with their own yards and, famously, their own two-car garages. But as the tech industry has evolved away from wrestling with nature toward becoming a marketing and media juggernaut, businesses such as Twitter have flowed back to San Francisco. Sure, there’s no room for you to work on your hobby in your garage, but today’s tech titans don’t see why their employees should have time for hobbies. In the Twitter Age, status competitions tend to be played out online in the realm of ideology, with the more implausible your dogmas, the higher your status. In other words, we’ve managed to combine the worst of village and big-city life: There’s now an unlimited number of people at hand to take offense and remember you for it. And there’s no way to light out for the territory and start over, because now it all goes on your permanent record. When Did Healthy Communities Become Illegal? The scene is Upper Monarch Lake, ten thousand feet up in the mountains of the Sequoia National Park in California. If you got here, you climbed thousands of feet in elevation through the wilderness, carrying your tent, sleeping bag, and all your supplies on your back. There is not a single graffito or piece of trash to be seen. If you should happen to have neighbors in a nearby tent for the night, you will not worry a bit about whether they will steal your gear or harm you in the night, even though they are strangers. More likely, they’ll invite you to share some of their bourbon. Why do backpackers feel safe sleeping outside in public at 10,000 feet but not in their own city parks? It is the steep barrier to entry that creates this microcosm of community that so naturally emerges: anyone who has made it here has the physical, material, social, and informational resources to pass this natural test of good character. The same is true, to a lesser extent, of Burning Man – the travel and resource outlay required to get to the desert festival forms a barrier high enough to allow for the formation of a temporary community, one in which participants feel safer interacting with strangers than they might in their own hometowns. Natural human intuition about character has served people well in forming and pruning communities for thousands of years. Specific legal interventions in the United States, however, have limited the ability of individuals to act on their local social intuition and traditions, substituting a legal notion of radical inclusion. Legislation removed barriers to entry that people had erected for their communities, acting in turn on four core areas of social cohesion. While communities at first adapted to the new restrictions and evolved around them, eventually they became so warped that they began to fail to perform their most basic functions: providing members with social belonging, usefulness to others, a sense of meaning, and safety. The first of the big four areas of life to be threatened by legislation was business – especially the kind of business that might have been called an inn or public house in another time, that is, public accommodations and restaurants. The Civil Rights Act of 1964 made discrimination on the basis of race, color, religion, or national origin illegal for businesses of this kind. Federal and state laws have since expanded this anti-discrimination provision significantly; almost half of all states also prohibit discrimination against gay people by businesses, and Colorado recently forced a religious baker to either bake cakes for gay weddings, against his religious principles, or go out of business. No longer does the restaurateur, publican, or even baker have the privilege to exclude anyone he chooses from his premises and service, for any reason or no reason. Some argue that the publican is better off; with more potential customers, his market is larger now. But is money the only imaginable motivation for owning a small business of this sort, the kind that underpins communities? A barrier to entry for customers at the pub has been removed. The only barrier that is still legal – as we will see in later sections – is money. Rather than having an exclusive pub with its clientele weeded by a kingly proprietor, the patrons must pay high prices as a substitute barrier to entry. Another solution is to arrange businesses so that customers need not interact with strangers, a small-scale version of modern city planning. This is not a defense of the practice of racial discrimination. But outlawing bad discrimination has chilled the expression of good discrimination – of intuitive, personal discrimination, which sometimes but not always takes things like race or sexual orientation into account. (The race of neighbors at Upper Monarch Lake would scarcely make a difference.) Discrimination – the selection of some and exclusion of others for social interaction – had acquired the characteristic of a slur, but it is a necessary faculty for humans and groups. Peaceful people can hardly remain so if they can’t exclude destructive people. Discrimination, like speech, needs to be free from the chilling effects of lawsuits. The right of a business proprietor to kick out anyone he likes seems a minuscule freedom in comparison to decades of legal oppression of a race of people descended from legal slaves. But black communities have served as a mascot for legislation rather than actually benefitting from it. These areas were sought by the first hipster pioneers to benefit from the protection of the tough whites in those areas who had held out against the black-on-white race purge that was the 70’s and 80’s in Baltimore. The end result is that the housing values go up so much that the working and poor whites must move out as they can’t pay the taxes. Recently, beginning in the 2000s, Johns Hopkins University and Hospital have been buying up vast swaths of vacant property in East Baltimore [where Boomy the Nigerian cabby rescued the ‘blonde woman of the yuppies’] and along the Charles Village Corridor. This was in response to blacks preying on hospital and university staff. These large institutions are buying up the criminal seed beds which constitute perhaps a third of the black Baltimore economy [with welfare constituting roughly another third]. This has caused more damage to the drug gangs than any police action, and is covered in the final season of The Wire. Over the past two years a concerted effort to discourage white resettlement of Baltimore has been made by black criminal residents. However, the news spin and statistical manipulation engaged in by the leftist city government has successfully blinded the prospective home buyers of these facts until it is too late. It is no accident that the prime targets of the mob attacks were the Shoppers supermarket [which was successfully defended thanks to the early warnings put out by black cashiers from the neighborhood], and the CVS drug store which the Mayor gave orders not to defend. Both of these locations were only established due to city government initiatives to bring businesses into the neighborhood. Note that the most successful pockets of gentrification such as South Baltimore, Locust Point and Canton, fared better than the Hopkins controlled areas and the others, because they are neighborhoods with their backs against the water, and raiders have only one way out, with Locust Point, which terminates in Fort Mchenry National Park, being a virtual fortified position. During the 1800s, animal-drawn streetcar lines were built in cities across the United States. Starting in the 1880s, they were replaced by electrified streetcars, which quickly became the dominant mode of transportation in many cities. Running streetcars was a very profitable business. Cities expanded, and people who found themselves living too far from work to walk depended on them. (Some real-estate developers built nearby suburbs around streetcar lines.) Over time, the businessmen who ran the streetcars, called “traction magnates,” consolidated ownership of multiple lines, establishing powerful, oftentimes corrupt monopolies in many cities. Eventually, many of them contracted with city governments for the explicit right to operate as a monopoly in that city. In exchange, they agreed to all sorts of conditions. “Eager to receive guarantees on their large up-front investments, streetcar operators agreed to contract provisions that held fares constant at five cents and mandated that rail line owners maintain the pavement around their tracks,” writes Stephen Smith at Market Urbanism. 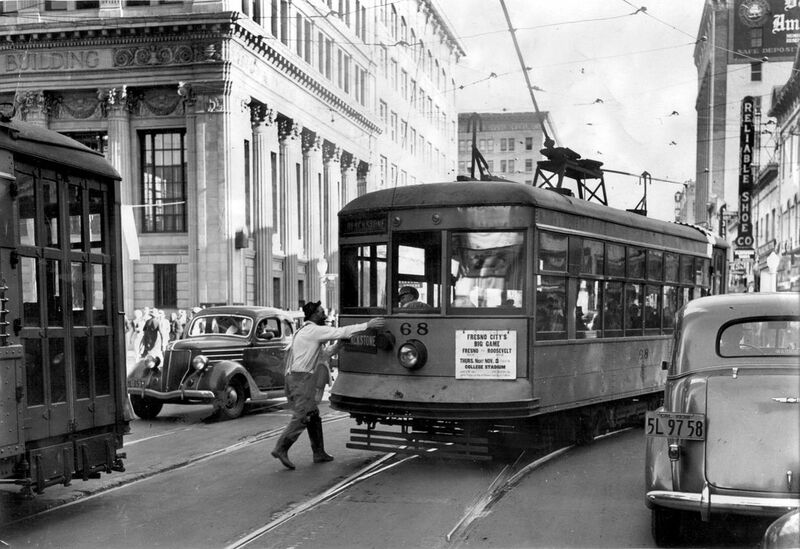 The real problem was that once cars appeared on the road, they could drive on streetcar tracks — and the streetcars could no longer operate efficiently. “Once just 10 percent or so of people were driving, the tracks were so crowded that [the streetcars] weren’t making their schedules,” Norton says. In some places, like Chicago, streetcars retained dedicated rights of way, and they survived. Pretty much anywhere else, they were doomed. “With 160,000 cars cramming onto Los Angeles streets in the 1920s, mass-transit riders complained of massive traffic jams and hourlong delays,” writes Cecilia Rasmussen at the Los Angeles Times. 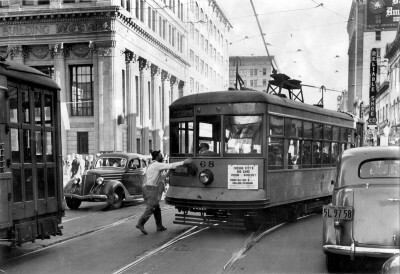 What’s more, in many cities the streetcars’ contracts required them to keep the pavement on the roads surrounding the tracks in good shape. This meant that the companies were effectively subsidizing automobile travel even as it cannibalized their business. And paying for this maintenance got more and more difficult for one key reason: many contracts had permanently locked companies into a 5-cent fare, which wasn’t indexed to inflation. The deadliest was the 1863 Draft Riot. More than 120 people were killed when the streets of Manhattan were taken over by protesters, many of them immigrants, who were furious at the prospect of having to fight in the Civil War. In the early decades of the 20th century, cities such as Atlanta and Chicago were torn apart as whites attacked newly urban blacks for perceived transgressions. Chicago’s 1919 riot began when a child crossed an invisible racial barrier while swimming in Lake Michigan. In the 1960s, there was widespread unrest. In many cases, including the 1965 Watts Riot, the violence began with an argument over law enforcement. These public disturbances are a classic example of tipping-point phenomena, which occur when there is some positive feedback mechanism that makes an activity more attractive, or less costly, as more people do it. There is a tipping point in rioting because the cost of participating — the risk of going to jail — gets lower as the number of people involved increases. If I decided to start rioting tomorrow in Harvard Square to express my outrage at the closing of the beloved Curious George children’s bookstore, it’s a pretty good bet that I would be immediately arrested. But if thousands of others were involved, I’d probably get off scot free. The police would be overwhelmed, and my probability of incarceration would fall to zero. Thus, riots occur when the shear mass of rioters overwhelms law enforcement. But how do these mass events get started? In some cases, such as the New York Draft Riot, organizers get people out on the street. In others, such as the 1965 Watts Riot, a peaceful crowd provides cover for initial lawlessness. Sporting events, such as Game 7 of the Stanley Cup Finals in Vancouver this year, can easily produce the crowds that allow a riot to start. Most strangely, riots can follow an event that creates a combination of anger and the shared perception that others will be rioting. The acquittal of police officers in the Rodney King case seems to have created these conditions in Los Angeles in 1992. The London riots appear to have had a simpler starting point. About 300 people gathered at a police station to protest the shooting of a 29-year-old suspect. Once there were so many angry people in one place, setting fire to an empty police car became a low-risk piece of pyrotechnics for the protesters. After riots, there is often an attempt to explain the outburst as the result of large societal forces. The events in the U.K. have been blamed on growing inequality and the current government’s austerity program. The disorder in the U.S. in the 1960s was attributed to racism. But across U.S. cities, there has never been much of a link between unrest and either inequality or poverty. In fact, the riots of the 1960s were actually slightly more common in cities that had more government spending. Riots were significantly less common in the South, where the Jim Crow laws were making their long overdue exit. This isn’t to say that many people involved in riots don’t have valid grievances, but plenty of people have serious grievances and don’t riot. Somewhat paradoxically, even though the police often provide the flash point for these outbreaks, larger police expenditures per capita in a city in 1960 was associated with fewer arrests and arsons when riots occurred. Even if a riot provides a wakeup call for police reform, in the short run, the outbreaks typically end only when there is enough law enforcement to ensure that such behavior leads to arrests. I hope the U.K. can handle its violence with a purely police response, but in the U.S. restoring law has typically meant bringing in the military. The 1863 Draft Riot ended when federal troops arrived after a long march from Maryland. Detroit’s terrible 1967 tumult ended with tanks on the streets. The National Guard was deployed in Los Angeles in 1992. Trying to stop a riot with too small a force can often lead to more, not less, bloodshed, because as the riot continues, vigilantes step in and beleaguered policemen can resort to brutality. My colleague Christopher Stone has argued that there is another lesson about fighting riots to be learned from the incidents in the Paris suburbs in 2005, and the violence that didn’t happen during the Republican National Convention in New York City in 2004. In France, the police initially arrested relatively few people, but sought serious criminal penalties for those they did arrest. The New York Police Department arrested more than 1,000 people and let them go. The New York strategy protected the city; the French strategy wasn’t as effective.